The files are extracted from the .TLDAT file from a DLC pack, they could possibly be all model files. .dps files are found in TOMDLB_D folder, .dc5 and .dat files are found in TOMDLP_P folder. The model itself is not the only thing I needed, the bones of the model are inside in one of the file types (.dps, .dc5, and .dat) and when the bones-like files are found, they have to be converted! I was able to find the model data easily for some of the dat files, but no luck with ".dc5" files. Here is "00000000000000a3.dat" for example. For "00000000000000c6.dc5" these should be the correct values, but it doesn't work. As you can from the ss, the first float is always NaN, and actually the next 2 floats look like uvs. Vertex positions might be somewhere else in the block, but I couldn't find them. The block size isn't that big anyway, so it might be that they are not floats. I noticed this immediately after posting. 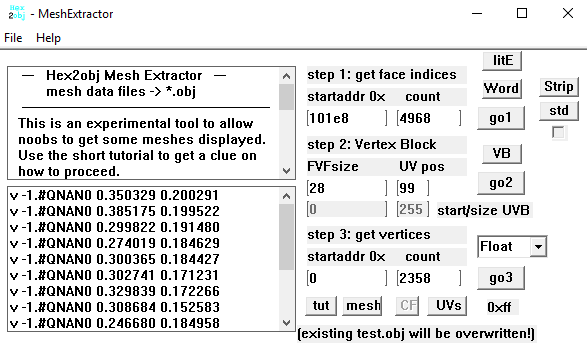 For the first dat with 52 bytes blocks, the UVs are right after "FF FF FF FF". In the "dc5" files the blocks start with "FF FF FF FF" and like I said it is probably followed by uvs. So it is like the ".dc5" files have blocks that are missing the first 24 bytes. It felt relevant, so I wanted to note this. Nevermind, I got it working. The format isn't that hard, but it is troublesome that the model data is scattered across multiple files. I have found the vertex positions/normals in the dpd file, and uvs/indices are in dc5. Also vertex block lengths are chaotic in dpd files. It started out with 28 bytes, then switched to 32 bytes, and lastly 36 bytes. This is for the vertex blocks of a single object. Maybe I can write a tool for this, but not many people seem to be interested in this game/series. I'll probably make good use out of a tool that can extract models directly from the game. I already extracted all base models form the game using Ninja Ripper at the time, even rigged up the main cast customly with the help of a third party, though grabbing out the raws would be a definitely nice thing. At the very least I'd support someone doing such a thing. That sounds like a lot of work. If I make a tool, I am planning to add skeleton support too. I have some free time next week. So I will take a look, and might possibly start working on a tool. It was been a week, is there any progress on that tool you are working on and the skeleton support? andree wrote: It was been a week, is there any progress on that tool you are working on and the skeleton support? No progress atm. I didn't have the time to start working on a tool. I have been a bit busy and also working on another game. I don't know when I will make a tool, but ToB is kind of high priority. I will get to it, when I have enough time. Well, gotta wait for someone to give out support for the bones. I think I figured it out. I wrote a noesis script seems to work for the most part (Except everything is mirrored and face morphs don't work). Tales of Berseria Tools (viewtopic.php?f=33&t=17346) can extract Textures with names so that helps a little. Everything else is a mess which makes finding things a pain. Select a TOMDLB_D and the script will ask you for the corresponding TOMDLP_P which will be the one next to it (Ex: 00003975_11fed272.TOMDLB_D and 00003976_11fe7099.TOMDLP_P are Velvet's Body) the script will then ask you for the TOMDLB_D that contains the Skeleton the model is built off of. This part will be rough if you need one that isn't 00001740_2eb14f7f.TOMDLB_D (That one works with Velvet's stuff) because otherwise you'll have to go datamining in 00001610_dde1b2fa.DAT and start matching model names to skeletons. If you pick the wrong skeleton the script will yell at you. I would have liked to streamline this process but this is the best I could come up with.